This Fermilab press release came out on Oct. 6, 2014. It’s the most powerful accelerator-based neutrino experiment ever built in the United States, and the longest-distance one in the world. It’s called NOvA, and after nearly five years of construction, scientists are now using the two massive detectors – placed 500 miles apart – to study one of nature’s most elusive subatomic particles. Scientists believe that a better understanding of neutrinos, one of the most abundant and difficult-to-study particles, may lead to a clearer picture of the origins of matter and the inner workings of the universe. 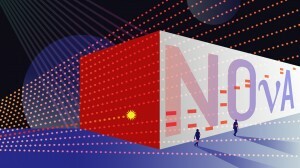 Using the world’s most powerful beam of neutrinos, generated at the U.S. Department of Energy’s Fermi National Accelerator Laboratory near Chicago, the NOvA experiment can precisely record the telltale traces of those rare instances when one of these ghostly particles interacts with matter. Construction on NOvA’s two massive neutrino detectors began in 2009. In September, the Department of Energy officially proclaimed construction of the experiment completed, on schedule and under budget. NOvA’s particle detectors were both constructed in the path of the neutrino beam sent from Fermilab in Batavia, Illinois, to northern Minnesota. The 300-ton near detector, installed underground at the laboratory, observes the neutrinos as they embark on their near-light-speed journey through the Earth, with no tunnel needed. The 14,000-ton far detector — constructed in Ash River, Minnesota, near the Canadian border – spots those neutrinos after their 500-mile trip and allows scientists to analyze how they change over that long distance. For the next six years, Fermilab will send tens of thousands of billions of neutrinos every second in a beam aimed at both detectors, and scientists expect to catch only a few each day in the far detector, so rarely do neutrinos interact with matter. From this data, scientists hope to learn more about how and why neutrinos change between one type and another. The three types, called flavors, are the muon, electron and tau neutrino. Over longer distances, neutrinos can flip between these flavors. NOvA is specifically designed to study muon neutrinos changing into electron neutrinos. Unraveling this mystery may help scientists understand why the universe is composed of matter and why that matter was not annihilated by antimatter after the big bang. Scientists will also probe the still-unknown masses of the three types of neutrinos in an attempt to determine which is the heaviest. The far detector in Minnesota is believed to be the largest free-standing plastic structure in the world, at 200 feet long, 50 feet high and 50 feet wide. Both detectors are constructed from PVC and filled with a scintillating liquid that gives off light when a neutrino interacts with it. Fiber optic cables transmit that light to a data acquisition system, which creates 3-D pictures of those interactions for scientists to analyze. The NOvA far detector in Ash River saw its first long-distance neutrinos in November 2013. The far detector is operated by the University of Minnesota under an agreement with Fermilab, and students at the university were employed to manufacture the component parts of both detectors. The NOvA collaboration comprises 208 scientists from 38 institutions in the United States, Brazil, the Czech Republic, Greece, India, Russia and the United Kingdom. The experiment receives funding from the U.S. Department of Energy, the National Science Foundation and other funding agencies. For more information, visit the experiment’s website: http://www-nova.fnal.gov. Note: NOvA stands for NuMI Off-Axis Electron Neutrino Appearance. NuMI is itself an acronym, standing for Neutrinos from the Main Injector, Fermilab’s flagship accelerator. Fermilab is America’s premier national laboratory for particle physics and accelerator research. A U.S. Department of Energy Office of Science laboratory, Fermilab is located near Chicago, Illinois, and operated under contract by the Fermi Research Alliance, LLC. Visit Fermilab’s website at www.fnal.gov and follow us on Twitter at @FermilabToday. The DOE Office of Science is the single largest supporter of basic research in the physical sciences in the United States and is working to address some of the most pressing challenges of our time. For more information, please visit science.energy.gov.